Commodore Christopher Rynd has commanded and driven many ships not only at Cunard Line but earlier in his career with Princess Cruises and P&O Cruises. These ships have included some great names such as Queen Elizabeth 2, Queen Mary 2 and the original Love Boat, Pacific Princess. However, there is a special place in his heart for Cunard's Queen Victoria. While Queen Victoria does an occasional transatlantic crossing, she spends most of her time cruising. Nonetheless, the ship seeks to provide an onboard experience in the tradition of Cunard's great ocean liners. In January 2015, Queen Victoria underwent a re-fit while in dry dock in Hamburg, Germany. Such refits are often the occasion for radical changes but here, the atmosphere onboard was preserved. Indeed, the most significant change to the ship was the conversion of some of the space that had been occupied by the ship's casino into nine single-occupancy staterooms. Apart from changing the cabin televisions to flat screen televisions throughout the ship, most of the other work done to the hotel portion of the ship was more in the nature of refurbishment. Originally, this refit had been scheduled for December 2015. However, it was brought forward in order to do work on the azipods - - the structures which both propel and steer the ship. Work was also done to enhance Queen Victoria's eco-friendliness. 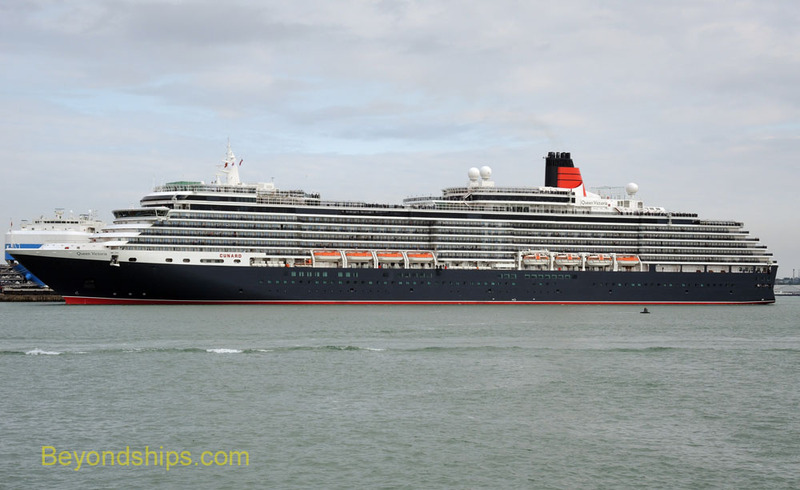 Queen Victoria is based on the Vista class design used extensively in the Holland America Line fleet (see, e.g., Westerdam, Noordam , Zuiderdam). However, the difference in the interior décor is not all that makes Queen Victoria different than her Holland America relations. While Queen Victoria and Queen Elizabeth are sister ships, they are not identical twins. The interior décor of the Victoria is, naturally, inspired by the Victorian age whereas the interior of the Elizabeth is more Art Deco-inspired. The Elizabeth also a covered area forward on Deck 12 whereas the Victoria's is open. The stern of the Elizabeth is squared whereas the Victoira's stern cascades over a number of tiers..